Domestic & Commercial Hard Floor Cleaners W West London | RDA Cleaning & Maintenance Ltd.
RDA Cleaning & Maintenance Ltd. provides expert hard floor cleaning services in West London W. With a team of highly trained professionals, our hard floor cleaning company has managed to spread its services on a wide scale. We are capable of this thanks to the high-quality products we use. First, the hard floor is inspected by our cleaning technician, so that the exact type of material is determined, as well as the condition of the floor and any treatable stains it has. If necessary, the old sealing is removed with modern and safe professional machines. After that, it is thoroughly hoovered. Any removable stains are pre-treated, and so are the heavily soiled areas. All solutions are tested beforehand on a hidden small spot of the floor for any possible negative reactions. Depending on the type of hard floor, a cleaning solution is applied, either with technology for emulsification, hot cleaning, pressure cleaning. Then the wooden, stone, tile & vilnyl floor is cleaned and dried off. A proper sealing product is used to protect the floor from fast soiling and staining. RDA Cleaning & Maintenance Ltd. has been cleaning and maintaining the hard floors of people and business establishments since 2008. 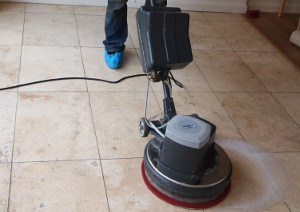 Through the years we have gained a lot of experience and knowledge, so today, our hard floor cleaners in West London Wcan handle any kind of indoor or outdoor floors. We use the high-quality cleaning products of Prochem that are environmentally friendly and safe, as well as the latest cleaning equipment and tools. Yet, we offer our professional hard floor cleaning service at affordable prices. We can offer you certain repairs, restorations and replacements of nearly any kind of hard floors. Our cleaners are certified and experienced in the proper surface polishing and protection of the floor. They work with biodegradable detergents that have no odour. This is to prevent any allergic reactions. The floor is treated in a way to preserve its good look and condition. If you want a team of highly-trained hard floor cleaning in West London W to help you out, give us a call on 020 3404 1646. You can also use our booking form. A customer assistant will get in touch with you right away. The nearest tube station serving W West London is Embankment.